So this is all subjective, and should be read in that light. 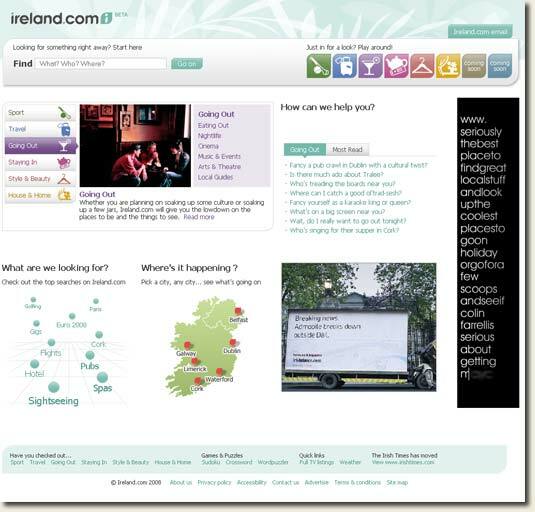 The first thing I have to say is that this is a great improvement over old ireland.com site. It’s looks like a newspaper website. The homepage uses a 3-column layout, and for now I’m basking in the vista of an ad-free Irish Times (wont last more than an hour or two I’m sure, and even then I can easily block it all). Would anyone agree that the active state background-colour contributes to an easier indication of current location? My poor mock-up may not be the best example however, and a strong high-contrast solour would do the job better I’m sure. People are used to looking for a ‘site map’. That’s the convention, and I can see no advantage at all in using terminology some people will not be familiar with. I like that, and I’m sure it was controversial given that they could have increased their Page Impressions by simply putting each image on it’s own page. Now that fold location will be different for most users, but the main problem it causes for me is that the fold occurs at a horizontal element which spans the full width of the page. That in turn removes a visual cue that there is more content further down the page. Had the fold occurred somewhere at the 3 column area, or if the page retained the 3 columns deeper down, I’d have an instant indication that there was more. A very small issue, but worth noting all the same. (For an interesting read about how important visual indicators are have a search for info on why Google included the copyright on their results pages). I think the the homepage voting feature is very much adrift (did you even notice it? ), and there’s something weird about the red play button on the 3 video thumbnails that I just cant figure out. Of course no blogs as we’d expect from the IT [Update: Damien found them, I’m obviously blind]. The weather feature is a great touch (hover over the weather in the masthead). You Haven’t mentioned SEO Once? Well there’s not too much to say just yet. But here’s a few things I noticed. 1. Homepage article URLs after rotating inside site? I’m not sure what will happen, but I noticed that homepage articles have /homepage/ in the URL. It will be interesting to see what happens after they rotate off homepage – will the URL change? Need to watch that one, but for now I’m not sure. User-agent:* should cover all the other User-agents listed below (if they are well-behaved), which makes those extra directives superfluous. Don’t you just hate it when you Lightbox doesn’t cover the full page height? I’m sure they are going to build this out over time, but I had expected Ireland.com to become a destination portal. There’s lots of opportunities to monetise this baby – I wonder have they got an affiliate marketer in there yet? Apologies for the long post (and God forbid you’re on dial-up for all those images…). Overall I think www.irishtimes.com is going to be a great success. I hope that they iteratively improve some of the boilerplate items that could be more usable. I have to commend the Irish Times for putting users ahead of monetisation – it’s clear to see that content has the highest priority, and adverts have not been positioned to disrupt the flow as is so often the case with newpapers these days. Compared to many other news sites I would have to say that I’m very, very impressed with the new Irish Times. Well done IT! I would like to see the Irish Times starting to use ALT tags on their images, like the one of Robert Mugabe at them moment. And I’m not sure about the moving text when you hover over the subsections on Crossword/Email/Competitions. 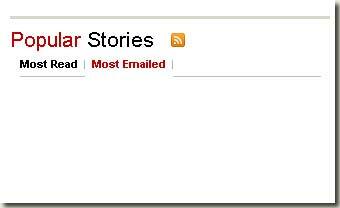 Also the Most Read/Most emailed feature doesn’t currently work for me. But maybe that’s because you currently can’t email an article to a Friend. Link fixed – thanks for that. I didn’t look at the ALTs actually, but one thing I did think of was the main image of Mugabe is not a live link. A lot of people click on images, and given the main image’s prominance, I’m sure this will be the case here also. Great take on the refresh, Richard. Great post Richard, and I agree with the navigation issue you’ve highlighted. I’d also like to add to the navigation observations, when not using a mouse (i.e. a tab key), it’s impossible to see what link is focused on. This has accessibility implications and is a really easy CSS fix. I’m not too impressed by the site. They have a good load of content and it’s a site I will use but there is a distinct lack of personality design wise. 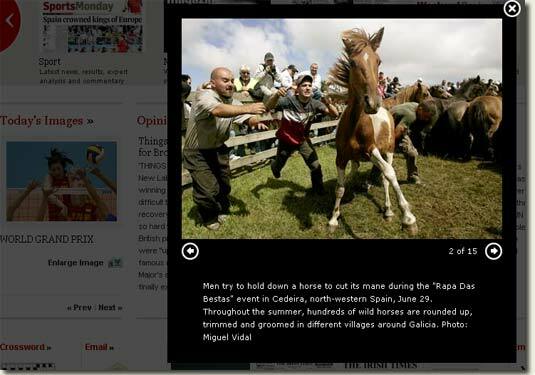 The font is very difficult to read and there is an awful lot of clutter on the homepage once you go below the fold. Five columns is a bit too much. Some of the text within the carousel is clipped too. Anything that wraps over three lines can’t be read (Safari). @Lar – hadn’t tried manually navigating, good point. I think you’ll find a lot more stuff on the accessibility side, and they’ll likely be badgering away today and in the near future to fix/improve these things. @Seb – my bad, and I updated the post to point to reflect this. Have to say though – I couldn’t see anything that pointed me at a blog when I visited earlier. Let’s just say there’s no prominent promos for the blogs. @Cormac – yeah it is a bit restrained. You look at the herald.ie and it has some nice use of colour and layout to pull the eye and demark different elements/content areas. But of course at the end of the day it’s about the content. It would be interesting to contrast all the top newspaper sites from a design/usability.functionality perspective actually. That example of the you are here indicators (images) don’t appear to be any different. So I couldn’t see your revised version. Other than that, it was a very indepth analysis. I find when it comes to SEO and large sites like this, they can often afford to be a bit more lax since they have so much content and often so many inbound links that they often rank well – even if they use unconventional (non-best practice) techniques / methods. I quite like the homepage layout myself. The columns are even and its a nice Grid layout. I’m hoping to learn more about Yahoo! CSS toolkit myself so i can achieve these kinds of layout using CSS and this is a good example of how neat those kind of layouts can look. I like the fact also that they have placed the Ads in the right hand corner and not in the middle of article content (how long it will stay like that I don’t know), if its one thing I hate about the Internet, its the way advertisers are trying to force advertising in our faces. Popups / roll over flash / Epileptic triggering flashing items / Punch the monkey animations, the list goes on. Unfortunately for me I work in the industry so can’t install ad blocker software – (not at work anyway) :(. The last image has a slightly off-white background in both the active tab and the subnav. There’s also one good reason why irishtimes.com shouldn’t be more lax – they have no history as the domain was just redirected. And I’ve noticed that Google is still returning ireland.com on searches for [irish times]. I think this is related to the page titles that were used. I too like the ad placement – more conscious of users than revenue IMO. ireland.com – What can you say,,, to me this looks like a hackney’d rip of a mix roadrunner.com and bbc.co.uk and badly failing to meet anything like the quality of either site. I’d have to agree with Liam on this one. IrishTimes.com is quite poor from a design perspective. * The header is cramped and main navigation isn’t nearly strongly defined enough. * The right-hand column seems to have been poorly conceived as well although I can see they’re gearing up to have some ad space in there. Although it looks like they may be over-doing this – do the Irish Times really need this much intrusive advertising? * The animated panels under the top 3 columns are jerky and the text hard to read. * The grid in the columns under this are all over the place. The scrolling supplement marquee. It seems to indicate that there are 3 ‘pages’ although there are only really 2. I would recommend the developers have a shufty through the code and see what’s going wrong here. * Near the bottom, where it has the ‘crossword’, ‘email’, ‘competitions’, etc. – maybe it’s just FF on Mac but the way the text starts to animate when you rollover the columns is really, really terrible. Maybe I’m being over-critical but I would just expect a lot more from a site with this much financial backing behind it. A lot of the basic tenets of good, clean, functional design are missing here and I really don’t understand why it isn’t a lot better. @Liam – I think the ireland.com redesign likely took a back seat. I’d say that’s more to have something there for the moment. @Ken – Some interesting points there. Wonder if there aren’t some browser/os issues here? Agree on main nav. I imagine this is what was pushed out the door on release date, and we’ll see further refinements in the short term. I imagine the IT folk are getting some decent feedback by now and will take notice of everything being said. @both – thanks for dropping by. @Richard Do you know something the rest of us don’t or were you involved in the redesign in some way/are you going to be involved in an SEO project with them/will you be pitching one to them? No disrespect but saying “I’m sure they’re working hard on fixing the glaringly obvious design flaws” in light of deserved criticism is a little suspect! 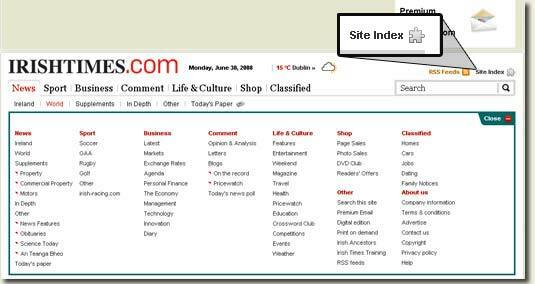 The Irish Times did very little to improve MyHome.ie so why would this site be any different? Well, that’s not entirely true. They got Webfactory to redesign MyHome.ie as well but, for a 50m website, it’s extremely poor effort (whether that be Webfactory’s fault or The Irish Time’s fault for not committing enough budget – who knows). Again, I’m not trying to rub anyone up the wrong way here but I really don’t think quality within the industry is going to improve if we’re busier trying to get into bed with the ‘big boys’ than we are showing them where they’re going wrong. Maybe I’m missing something, but dont IT have their own web team and digital side also? They might outsource the build, but that surely doesn’t mean they have no internal expertise overseeing this? @Ken – I have no relationship whatsoever with IT. Other than meeting Ronan Murphy at IIA Congress (as mentioned in my previous post) and receiving the PR (same post BTW), I have had no contact whatsoever with IT prior to this post. When I met Ronan with a group of 12 individuals he discussed the project, and it was quite obvious that it was a major undertaking. I have no intention of pitching anything to IT due to other client work. Not sure why you think I’m trying to ‘get into bed’ with them. The post was written to highlight what were, in my opinion, initial deficiencies with the new site. And given that I have had chances to work with large clients, I also understand that deadlines have to be met, and sometimes that means a release which isn’t 100%. Do you honestly think that the work on this stopped when they released it? C’mon Ken, you know the deal here – you’re not wet around the ears. I’ve written my opinion above, and I stick with the view that compared to where they were (ireland.com) and what I’m looking at today (irishtimes.com) they’ve done quite a good job. Feel free to write your opinions here or elsewhere if you disagree with my opinion, but please do both you and me a favour – leave your tinhat at the door before jumping to any more conclusions about my intentions. @Richard – fine, you say that there’s no agenda there and I’ll take you at your word. Anyway even if there was, so what? All I was saying was that it seems odd that there are criticisms to be made and you’re plastering over them for absolutely no reason whatsoever. There are obvious issues with the design of the site. Let’s leave it at that and not make any wild predictions as to the honorable intentions of the IT to fix them. As we both know, this is rarely the norm when companies think they’ve already ‘got it right’. Webfactory are already describing the site as ‘the fruit of over 8 month’s analysis and design concepts. 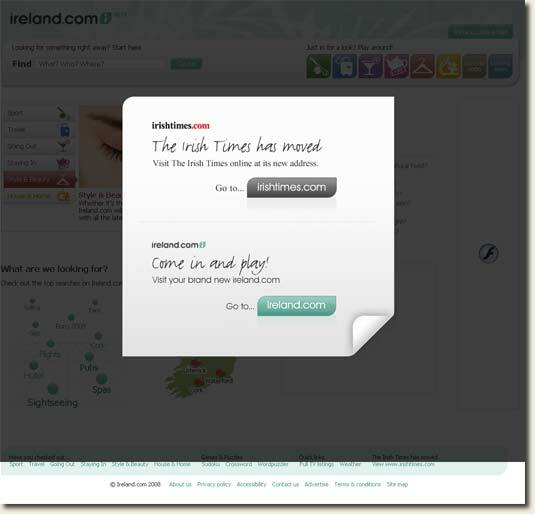 It uses the latest in proven design technologies to ensure irishtimes.com users enjoy the best interaction experience possible… an enhanced user experience…” – this is hardly the case. Just short of getting bitchy, which isn’t my intention, the site is sorely lacking. Although I hope you’re right and that they do refine it. Anyone else finding navigating around their blogs near impossible? You can’t go from a blog post back to the blog homepage at all. Bizarre. I think the new website looks great. Its easier to navigate and how can you complain when its now free. I think it really says somthing about the level of customer service. We wanted it free and now it is free! I think the irishtimes.com is a big step forward and like every new or redeveloped site people need to give it a chance and let it work out its bugs. 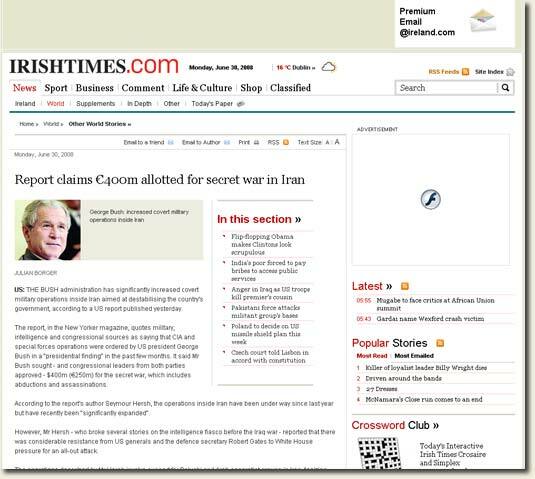 I THINK THAT THE NEW IRISH TIMES WEBSITE IS FANTASTIC!!! It’s great to see that they are getting out there like there competitors and going free! I am a proud supporter of the paper and read it Monday through Saturday. I think all those complaining better think again because they have made these changes so you can have access to the Irish times online for FREE!! Cant you ever be happy!! I just want to make a general point to anyone who wants to comment anonymously – very often I can track you back, and find a number of footprints via your IP. The internet is truly a wonderful thing, especially for tracing traffic. I’m delighted people want to comment on my wee blog, but if they do have a vested interest it would be nice for them to state so. Please note: this is a general comment and should not be construed to contain anything ‘between the lines’. Woah – Bob back from the dead. And he’s an Irish Times reader. @Amanda and @Bob Marley – The criticisms being made are being made largely by Web designers and developers who feel that the design of the site isn’t up to scratch. It has nothing to do with the fact that the IT have decided to make their site content free. I actually commend them for this. Their paid subscription model was always doomed to eventual failure anyway. FWIW, I read the IT most days; this isn’t an attack on them, rather on the quality of their new site. @Ken – I have a suspicion they wont see your follow-up via email, but someone may well see it by visiting in person. Very good write up on the ‘new’ site. I found your post by searching after any hints about a mobile version of the irishtimes.com website. So far, I’ve had no luck in finding a proper mobile version which IMHO is quite odd. 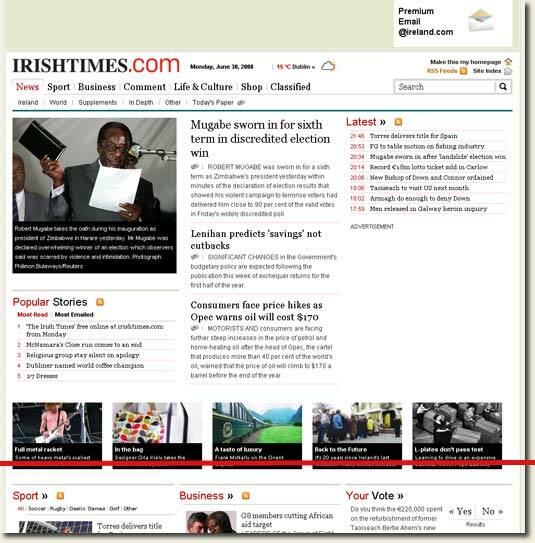 How can a newspaper, the size of irishtimes.com, redesign and launch their online version in the year 2008 without a mobile version? Or am I just too blind to see it? In fairness, there are some fairly immense obstacles to getting a news site onto mobile. While there are some off-the-shelf solutions, generally site owners often need to go bespoke, and I’m pretty sure this is costly. Perhaps IT have a mobile strategy which is still in development (I must try to find out TBH).